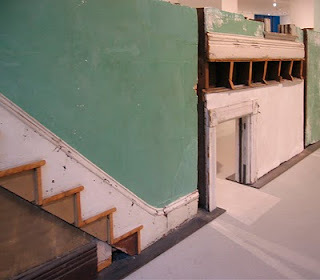 Gordon Matta-Clark is one of my heroes. He had the balls, brains and brawn to physically attack buildings and to forever alter our perception of building demolition, its inherently stimulating, fascinating nature, as well as the social, political and economic implications of the progressive aspects of modernist urban planning (aka, urban renewal). When I heard this exhibition was coming to the Pulitzer Foundation I was truly excited. I'd read about his project Splitting from the early 1970s many years ago while an architecture student at Washington University in Saint Louis. 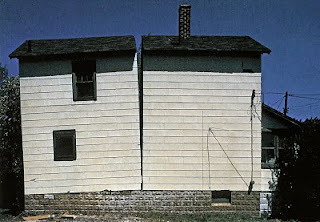 His simple act of slicing a house in half was alternately confounding and exciting. I wasn't quite sure what to expect at the opening, but was thoroughly impressed and energized by the work on display. It was a great event where I met several friends and made some new ones. The Pulitzer's web communications specialist Amy Broadway had a small Flip mino on a tripod that she used to record visitor's thoughts and reactions to the show. She noticed me chattering away up on the balcony overlooking the main gallery and stopped by to capture my architecture-related ramblings. In the past, I've avoided being "on camera", preferring to be the one looking through the lens capturing images. This brief encounter with speaking into a surprisingly diminutive black plastic device offered me a much more positive, exhilarating experience especially when compared to the massive black and white television studio cameras I'd used way back in high school when exploring my AV interests. When the Pulitzer asked if I'd be interested to speak about one of the pieces on display as part of their "Frame of Reference" series I was simultaneously flattered and excited. 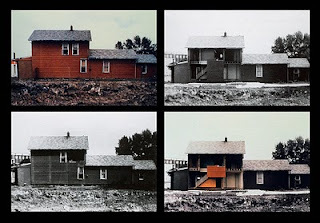 I immediately knew the piece I was most fascinated by was Bingo represented by three wall sections in the main gallery along with a series of photographs documenting the sequence of Matta-Clark's deliberate carving into the side wall of that red sided house. His decision to leave the central square remaining, hanging in space, after having removed the eight other wall sections surrounding was wonderfully playful and insightfully critical. 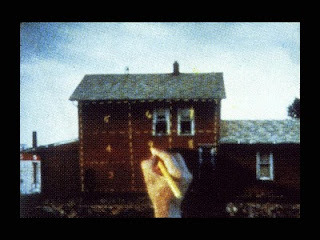 I interpreted the nine-square grid Matta-Clark superimposed on the house in light of the architectural theory/propaganda he learned while a student at Cornell University's School of Architecture during the 1960s. One of the chief theorists at the school was Colin Rowe, a writer and critic famous for his essay "The Mathematics of the Ideal Villa" (1947) which related the abstract grids behind Palladio's Classical villas from the time of the Renaissance and Le Corbusier's 20th century modernist villas. Mid-Century Modern Design . . . for Kids ! SLAM expansion is back on ! Hang with Robert Irwin tonight !